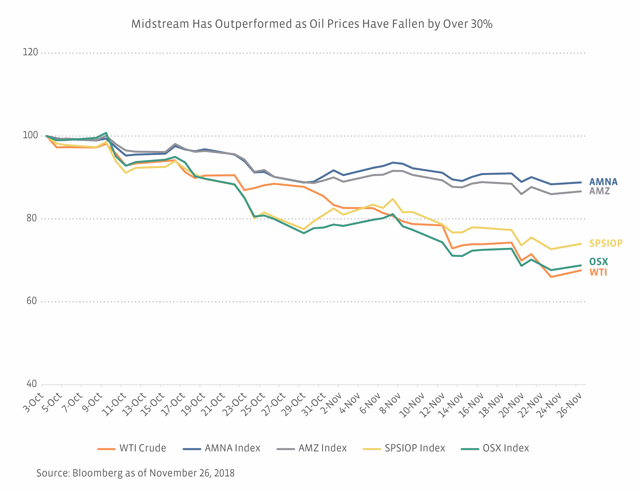 Before the recent pullback in oil prices, we were often asked this year why MLP and midstream performance had not been better given the recovery in oil prices. Even as oil prices have fallen significantly, we are still fielding questions on why MLP and midstream performance has not been better. 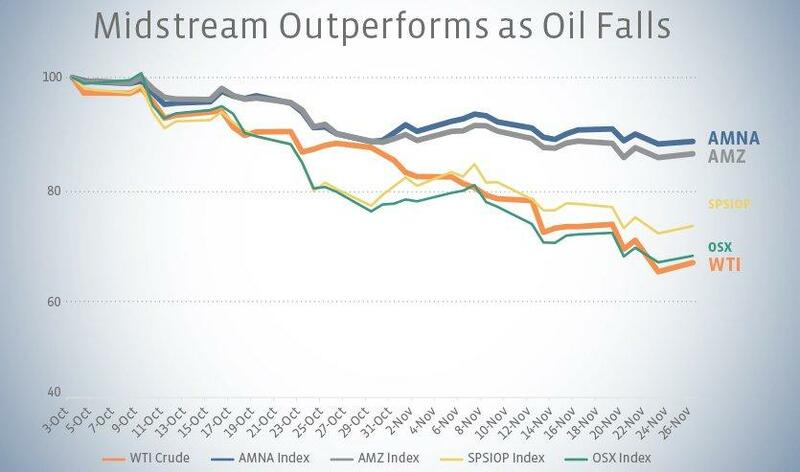 Has MLP and midstream performance been that bad recently? 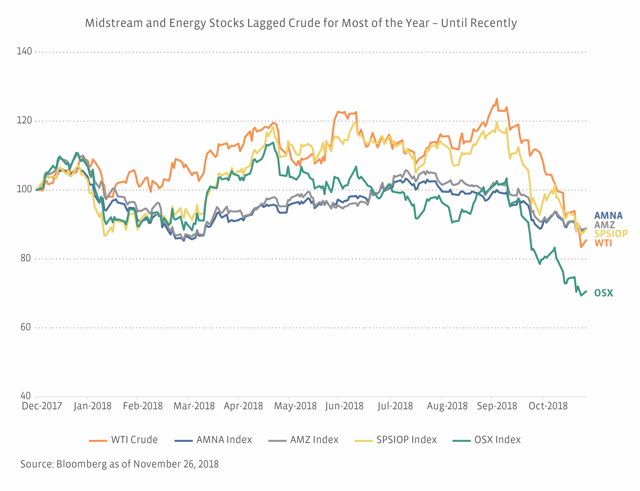 WTI fell over 20% last month, and the Alerian MLP Index (AMZ) was down only 2.2% on a price return basis and down less than 1% on a total return basis. 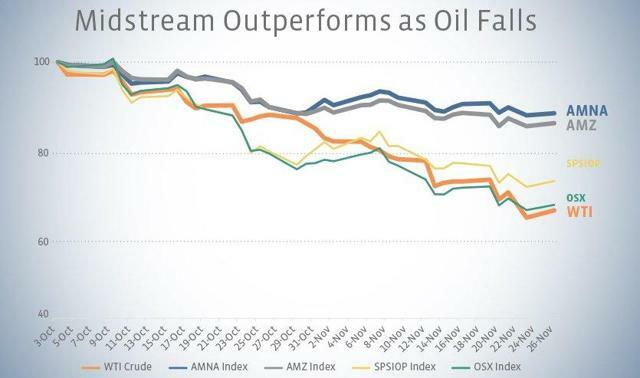 The Alerian Midstream Energy Select Index (AMNA) was actually up 0.5% on a total return basis for the month. Taking into account the ~30% decline in oil prices over the last two months, we would argue that midstream is performing in line with its defensive nature. Today, we look at MLP and midstream performance relative to crude and other sectors of energy. We also discuss some of the tailwinds working in midstream's favor, and the potential implications of a prolonged oil price decline. Anyone who has played a team sport has probably heard that "defense wins games" (at least I heard it all the time playing basketball). With energy investing, MLPs and midstream are defensive. 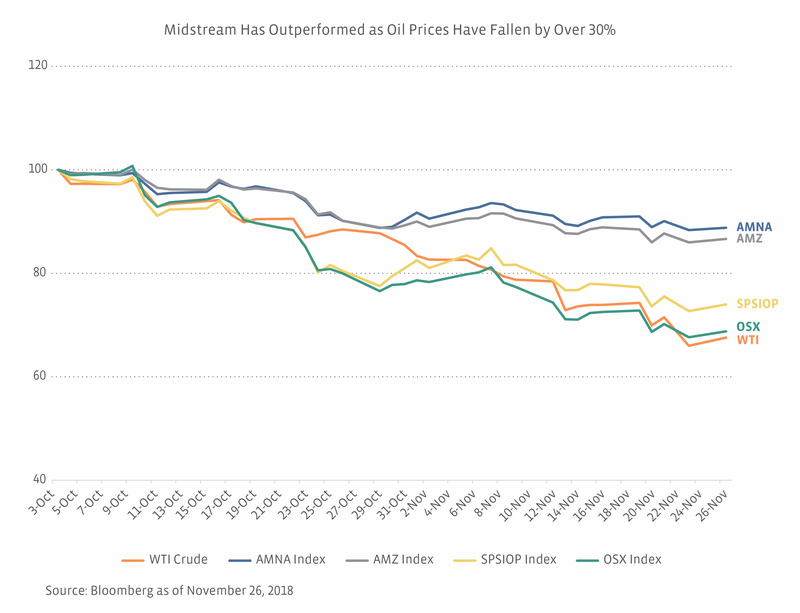 For most of this year, midstream and other energy stocks were underperforming relative to the gains in crude, as shown in the chart of relative performance below. Without digressing too much, there are several possible explanations for the lagging performance of energy companies relative to crude. Examples include the underinvestment in energy broadly, as evidenced by energy's low weighting1 in the S&P 500, and sector-specific concerns, such as capital discipline, the ability of producers to live within cash flows, and structure questions creating an overhang on the midstream space. E&Ps were leading the way in terms of sector performance, which fits with a generally rising crude environment that we saw until October. It may feel like ancient history now, but WTI crude closed above $76 per barrel on October 3. Since then, oil prices have declined more than 30% through November 30, dragging down energy stocks. The midstream space has been negatively impacted, but it is holding up much better than its energy counterparts, as shown below. Setting aside price performance, the yields on the AMZ and AMNA were 8.3% and 6.4%, respectively, as of November 30. We would expect midstream to be more defensive in a falling price environment, and that is holding true. Additionally, we continue to see midstream asset sales (often to private equity firms) at attractive multiples, which highlights the value of these underlying assets. 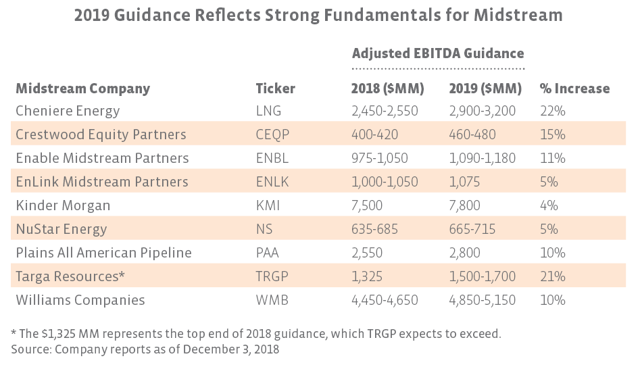 For example, First Reserve recently agreed to buy Dominion Energy's (NYSE:D) 50% stake in Blue Racer Midstream at a 14x-16x multiple2 of estimated 2018 EBITDA. Similarly in August, SemGroup (NYSE:SEMG) announced the sale of a 49% interest in the Maurepas Pipeline to Alinda Capital Partners at a multiple of 13x EBITDA. For context, the weighted average forward EV/EBITDA multiple3 for the Alerian MLP Infrastructure Index (AMZI) constituents was 10.2x as of November 30. Continued oil price weakness is a risk and would be negative for the midstream space in terms of both investor sentiment and duration, especially if the weakness persists long enough to slow production growth. WTI at Cushing is trading around $53/bbl, but benchmark prices are in the mid-$40s in the Permian and the Bakken due to inadequate takeaway capacity (read more). We think any significant production response (i.e., a decline not just due to winter weather4) would be a matter of months rather than weeks, assuming oil prices continue to weaken. For reference, WTI Midland crude, the Permian benchmark, averaged just under $46/bbl for May through September 2017, and production grew by 200,000 barrels per day from May to September. History would suggest that Permian production can grow in a mid-$40s oil price environment. Could lower prices be a risk for pipelines under construction? MLPs and midstream companies build pipelines with firm commitments for capacity that will support a desired return. Spot shipments (shipments made ad hoc or without long-term commitments) could be impacted, but those are really icing on the cake. Spot shipments are like getting $55 for your birthday from your grandparents instead of the $50 they have given you for prior birthdays - a pleasant surprise that you weren't budgeting for. Keep in mind, the addition of new takeaway capacity would support pricing in producing regions to the benefit of producers, improving their netbacks. We would be remiss if we did not acknowledge the significant gains in natural gas prices as oil prices have fallen. Since early October, Henry Hub natural gas has gained more than 30%. The price increase reflects seasonality and low gas inventories entering winter, among other factors. 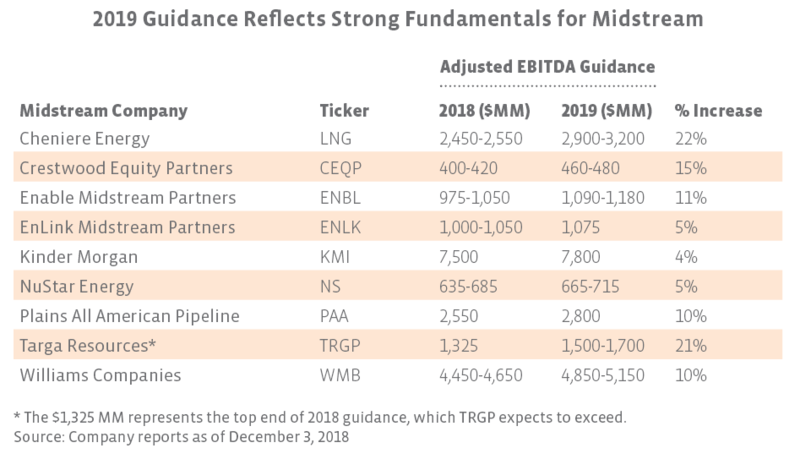 While improving natural gas prices don't hurt, we don't think the price rise has been the determining factor in MLP and midstream outperformance. 1 Energy represented ~5.5% of the S&P 500 as of late November. 2 The range represents the bookends of potential earnout payments to be paid in 2019 to 2021 depending on the acquired assets’ performance. 3 Weighted average based on the weighting as of the October 19, 2018 special rebalancing. Based on Bloomberg EV/2019 Estimated EBITDA. 4 For example, an ice storm in the Permian could interrupt the trucking of oil volumes from wells to hubs.